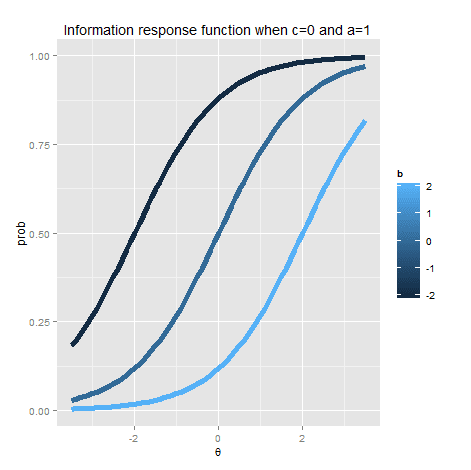 In the following post I will map out some item information functions for item response theory (IRT) models using the common 3 parameter logistic model for binary responses. 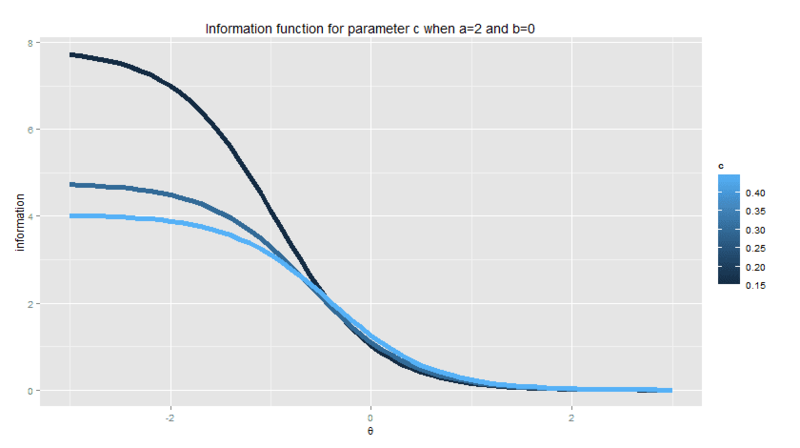 The model takes three parameters (obviously) which relate to the item features easily named a, b, and c. a refers to item discrimination or ability to tell between subjects with high ability and low ability while b is connected with item difficulty and c is commonly known as the guessing parameter. This is a value which represents the minimum probability a subject should have of getting the answer correct if the subject knows nothing. See below to see this probability mapped out. This post is not so much about the probability of correct responses using the 3PL but also the information functions associated with the 3PL model. Now let us see how they look. 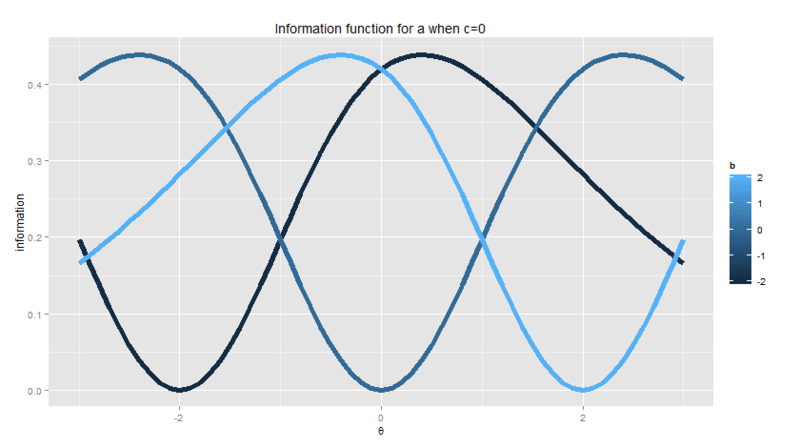 I will not explain the components of each graph as such things have been explained by many others. 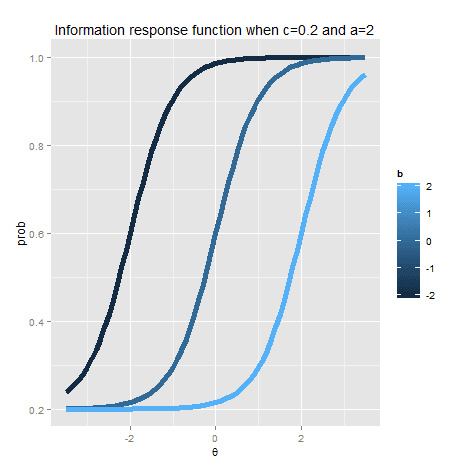 Reading the wikipedia article on Item Response Theory and the Stocking 1990 paper "Specifying Optimum Examinees for Item Parameter Estimation in Item Response Theory" will give the curious fairly detailed sources to learn from. Okay, okay, I will add some commentary. With regards to item information about subject ability it is clear that we want to target items at the point closest to where the subject has a equal or near equal probability of answering correctly or incorrectly. The more questions we drop on that location the more likely the response pattern will be something like 1,0,1,1,0,0,0,1 which will tell use that the subject's ability is at or very close to that level. As we move away from that point the information we have with regards to subject ability begins to decline. 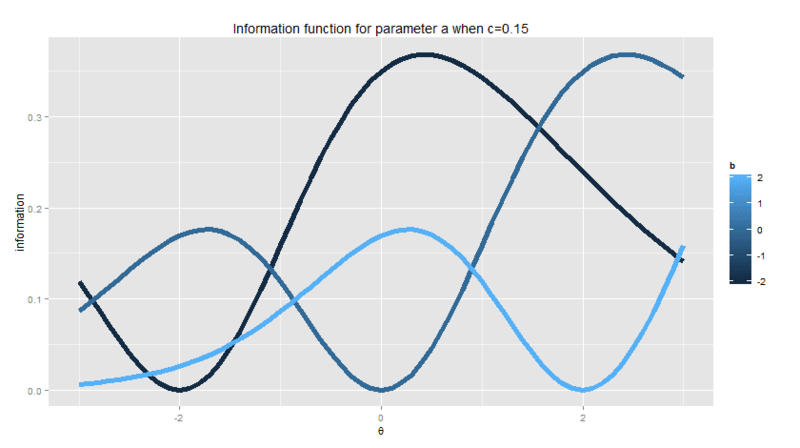 Notice how items which have a higher a parameter not only have steeper information functions but also considerably larger values (in terms of magnitude) which is significant. For this reason computerized adaptive tests must be carefully controlled through various exposure mechanisms so as to prevent those items which have the most discrimination from always being given. 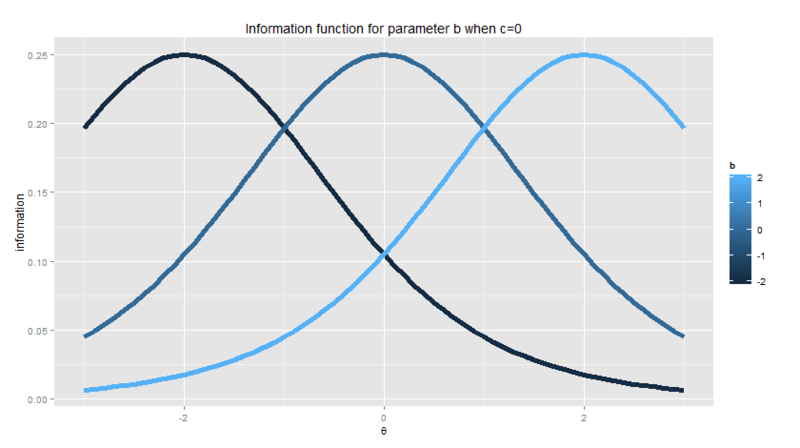 Note how the information with regards to the b parameter and theta is maximized at the same point when c=0 (which is b=theta). 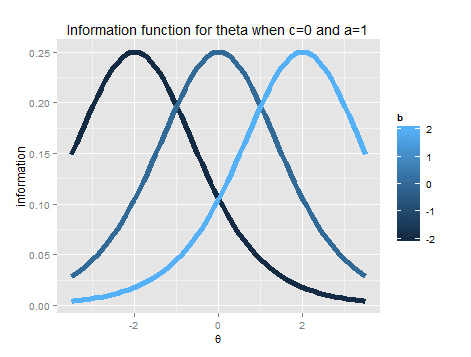 When c>0 the optimal point for getting information for theta is offset to the right but so it is for theta (though not depicted in a graph). Thus regardless of which information you are seeking, item difficulty or test taker ability, you face a similar optimization when delivering items. 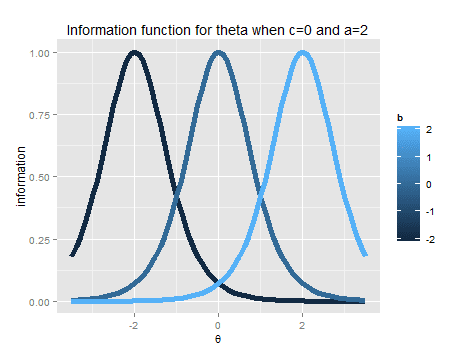 This is in stark contrast to item parameter a which has information minimized when b=theta. 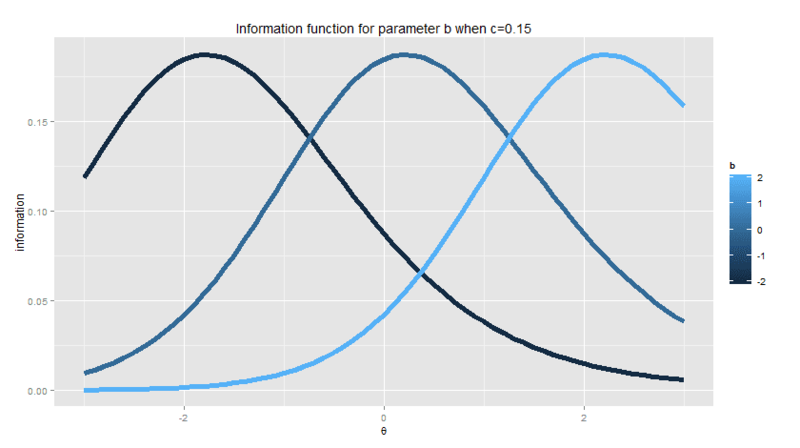 Information with regards to a parameter is best garnished when the question is taken by a test taker with considerably higher or lower ability (when c=0) and only with considerably higher ability (when c=.15). 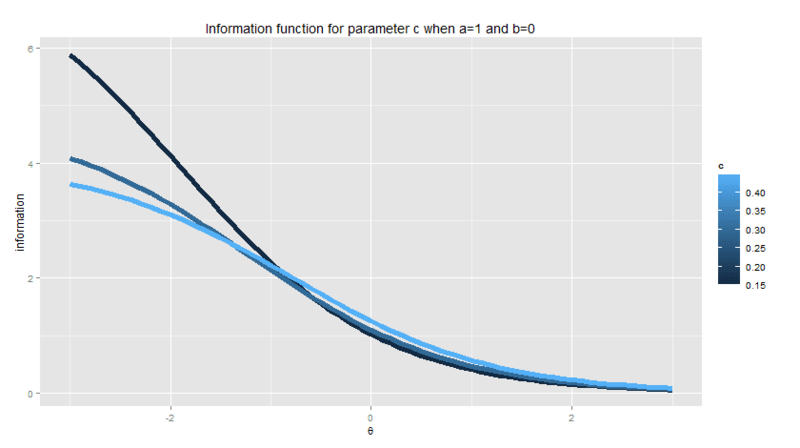 This is in contrast yet again with the information regarding the c parameter which is optimized when a question is taken by a subject who has considerably lower ability than the item difficulty. # is a well known equation.